Of course, it is the summer so I might not post everyday of the week. 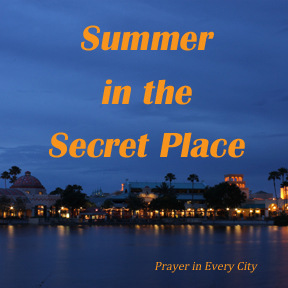 Please join us as we learn how to spend our summer in the secret place of the most high (Psalm 91). I have been lazy too. The Lord convicted me of this by giving me a horrible day with the kids and allowing Satan to have his way with me! It slapped me right in the face that I’d been neglecting my quiet time. I’ve been using the guide for global day of prayer this weekend. Thanks for keeping me on task! I have to admit that I get lazy myself. I haven’t taught a Bible study in a few months so I have neglected my studies. I can tell a huge difference in my life. It is more difficult to hear the Lord speak without both prayer and Bible study. I like the schedule above…especially the “spiritual warfare” prep. on Saturday! Thank you for your comment. I have not posted on spiritual warfare, but will get around to it before the summer is over. It’s a broad topic so I am not sure what to cover. It is a topic which can be approached from a few different angles. Yet, it is so very important to understand the “warring for souls” which is going on! Good luck in studying on the topic!